Ahead of our review coming Wednesday 31st January, here is a little more information ahead of Theatr Clwyd’s run of the hugely popular and charming Emma Rice production of The Little Matchgirl and Other Happier Tales. Theatr Clwyd warmly welcome you to see their production of The Little Matchgirl and Other Happier Tales. Written and co-adapted by Joel Horwood and Emma Rice, this highly acclaimed production comes to North Wales after having been enjoyed inside Shakespeare’s Globe in London and in the Bristol Old Vic. Director Emma Rice brings her last production as Artistic Director of Shakespeare’s Globe on a national tour. 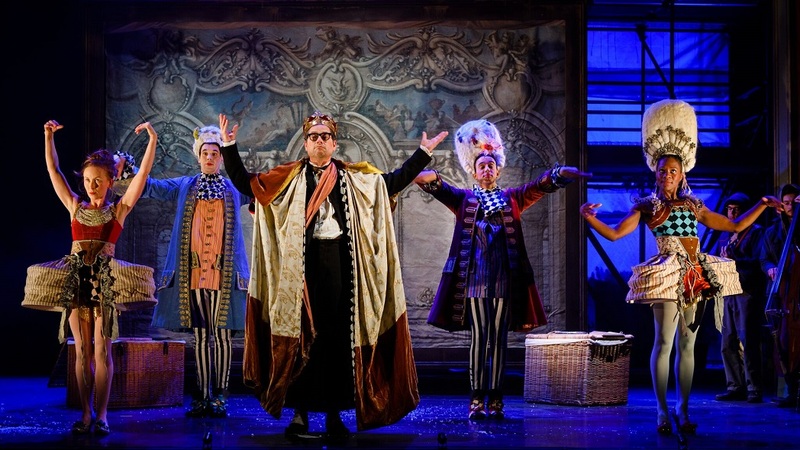 The production has been inspired by Hans Christian Anderson’s The Little Matchgirl and combines this with such beloved fairy tales as The Princess and the Pea, The Emporer’s New Clothes, Thumbelina and more. Struggling to survive on the freezing winter streets, our improverished heroine begins to strike her dwindling stock of matches. Each match she strikes conjures a new story and while it burns she escapes into an enchanting world of magic and mystery. The production is a moving collection of fairy tales loved by generations, as well as being a “patchwork of crazy fun” which will be a joy for families, brave children and parents alike. Starring Niall Ashdown as ‘Old Shuteye’/’The Emporerer’, Edie Edmundson as ‘Puppeteer’/’The Little Matchgirl’, Guy Hughes as ‘Ralph’/’Beetle’/’Mole’/’Trickster’/’The Prince’, Kezrina James as ‘Thumbelina’s Mother’/’Field Mouse’/’The Princess’. Katy Owen as ‘Thumbelina’/’Trickster’, Karl Queensborough as ‘Toad’/’Beetle’/’Swallow’/’Soldier’ and Elizabeth Westcott as ‘Jackson’. The Little Matchgirl and Other Happier Tales will be in Theatr Clwyd’s Anthony Hopkins Theatre from Tuesday 30th January until Saturday 3rd February at 7:30pm, with matinee performances on Thursday 1st February at 1pm and Saturday 3rd February at 2:30pm. Tickets are available for as little as £10.